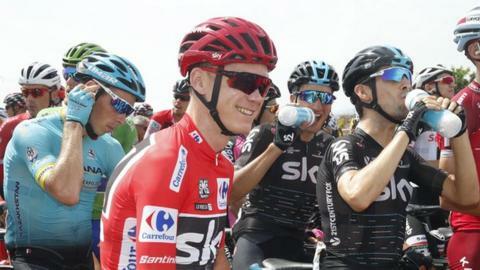 Britain's Chris Froome maintained an 11-second lead in Vuelta a Espana as Slovenian Matej Mohoric produced a brilliant break to win stage seven. Froome, aiming to become the third man to win the Vuelta and the Tour de France in the same year, finished among the pack on the 207km stage. Colombia's Esteban Chaves remains in second with Irish BMC rider Nicolas Roche in third. Mohoric, 22, won the stage after making a break with 10km remaining. The UAE Team Emirates rider finished 16 seconds ahead of Poland's Pawel Poljanski who pipped Spaniard Jose Joaquin Rojas on the line. "It's been a long time since my last big win," said Mohoric. "It feels great to get a victory again. "I felt good in a breakaway the other day so I knew my shape was good." Saturday's eighth stage sees the riders move on to Hellin where they will navigate a 199.5km course which includes an ascent up the testing Xorret de Cati followed by a slight uphill finish. Team Sky rider Froome said: "Today was a lot more relaxed and we were more in control. Tomorrow is a really tough finish. It'll be a big battle tomorrow."